Let’s explore the traditions of Chuseok, the history behind some of the foods, and the differences between North and South Korean Chuseok. So first of all, Happy Chuseok to all of those in and outside of Korea. The first day was yesterday, and the last day is tomorrow. Chuseok is the Autumn harvest festival in Korea, and it’s when Koreans return home and visit family, visit the graves of deceased family members and clean off the grave sites. As a celebration of the good harvest, Koreans visit their ancestral hometowns and share a feast of Korean traditional food during Chuseok, such as songpyeon and rice wines such as sindoju and dongdongju. 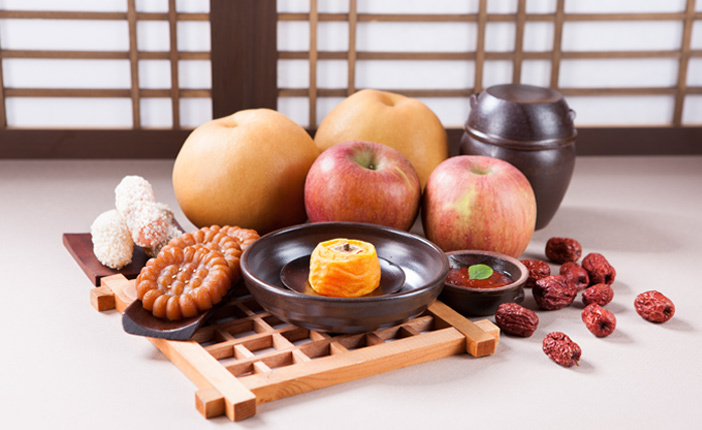 There are two major traditions related to Chuseok: Charye (ancestor memorial services at home) and Seongmyo (family visit to the ancestral graves). 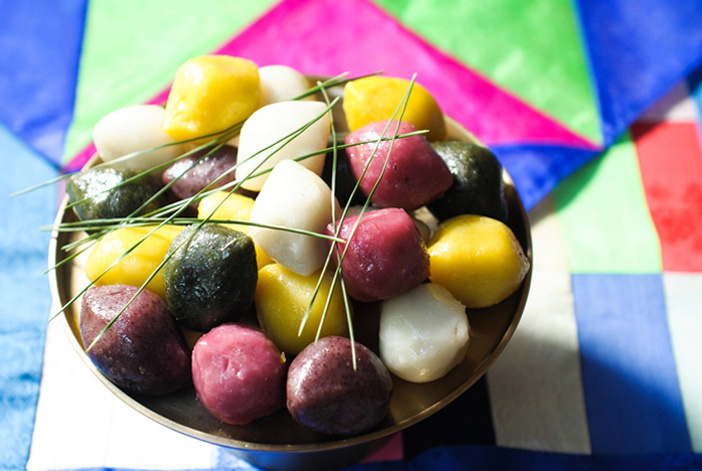 Traditional foods that are made include songpyeon, which is a rice cake stuffed with things such as sesame seeds, black beans, mung beans, cinnamon, pine nut, walnut, chestnut, jujube, and honey. They’re shaped like half-moons and eaten under the full moon for good luck. Hangwa, made with rice flour, honey, fruit and roots. This is not only eaten during Chuseok, but during weddings, birthday parties and other important days. other Hangwa such as Yakgwa, is a medicinal cookie, and Dasik is actually a tea cake. Baekseju is alcohol that’s drunk during Chuseok. There are many varieties. The belief is, if you drink what the ancestors drank, there’s nothing you’ll be afraid of. 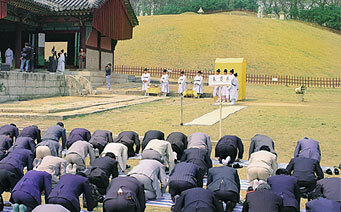 Giving gifts is normal during Chuseok, and has changed over time. During the 1960-70s, people were given sugar, soap or condiments. in the 90’s, people were given gift vouchers. However, nowadays, people give gift boxes most of the time. A lot of time, there are pre-packaged gift boxes in the store, or you could go to specialty stores. But be warned, a lot of stuff is marked up for the holidays. Gift giving tips: Don’t give your boss personal hygiene products. Giving gifts to friends is uncommon but if you do, dried persimmons or ghams is acceptable. gift boxes from the the stores are *usually reasonably priced and acceptable. Spam is super popular. So is fruit, but fruit can get hella expensive. Games are a huge part of Chuseok, since it started out as a weaving festival (or so the origin story goes during 935 AD) during the reign of the third king of the kingdom of Silla. Games traditionally played during Chuseok are Ssirieum, which is a type of wrestling game, Juldarigi or tug-of-war, Chicken Fight (not actual chickens, you just pose like one), or Go-Stop, a popular card game. 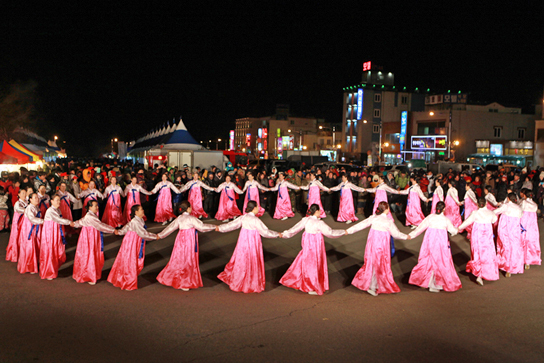 There is also the traditional circle dance, Ganggangsullae, done by women in hanboks under the full moon while singing and holding hands. The stories go, during the Joseon era, the Korean army used to have women dress up in their gear and go around the mountains to make the army look bigger than it appeared. It actually worked, and they won a lot of battles this way thanks to this scare tactic. Now North Korean Chuseok is a little different. In the North, families live close together. Why? It doesn’t make sense to live far away. In North Korea, you need a permit to drive a car or ride a train. If you don’t have the right permits (and a lot of times, even if you do), you’ll need to bribe the North Korean soldiers/police on the roads/trains. So the people who can freely travel if need be, are the upper and elite class of the North. Now such as in the South, they still clean off the graves (Sseongmyo) and offer food/have the memorial services(Charye), have a big dinner, but they do that all in the same day, rather than do both events separately. As you can see, though there are differences, both countries enjoy the festivities and camaraderie that Chuseok brings to families. Happy Holidays!